Positron Emission Tomography (PET) is a medical diagnostic technique in which nuclear medicine imaging procedure is used to identify certain disease conditions by monitor various internal body organs and tissues. Globally, increasing demand for effective diagnostic techniques across the globe, growing Medicare coverage for positron emission tomography scanning, growing investment by government bodies, rapidly increasing aging population, rising awareness among people, and development and availability of technologically advanced PET machines are the prime growth drivers of global positron emission tomography market. 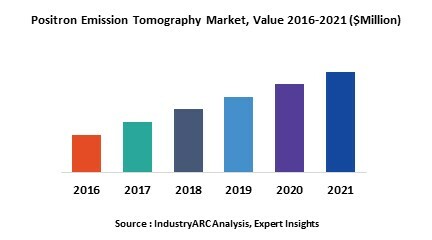 In addition, increase in adoption of positron emission tomography for application in emerging economies such as China, India and others, will create new opportunities for global positron emission tomography market. However, higher initial investment, low supply of radiopharmaceuticals, and risk of a short half life are the key restraints for global positron emission tomography market. Geographically North America dominated global positron emission tomography market and is projected to have fastest growth, owing to rapidly increasing aging population, high healthcare facilities and expenditure, technological advancement, rise in consumer awareness, favourable government policies, and modernization of healthcare infrastructure in developing nations such as China, and India in this region. Among all the end-user, hospital segment has the highest market share in global positron emission tomography market. Full Ring Positron Emission Tomography Scanners are the market leaders in all types of positron emission tomography. This report identifies the global positron emission tomography market size in for the year 2014-2016, and forecast of the same for year 2021. It also highlights the market drivers, restraints, growth indicators, challenges, and other key aspects with respect to global positron emission tomography market. Yangzhou Kindsway Biotech Co. Ltd.
16.2. Yangzhou Kindsway Biotech Co. Ltd.